Looking for our key documents? Exciting news! During December 2018 we were visited by OFSTED for a Section 8 monitoring inspection and we are so pleased with the report which states that student outcomes are now good and that leaders and governors are taking effective action to address the areas for improvement since the last inspection. Click the link below to to read the full report and accompanying letter from Mr Cunningham, our Headteacher. This provides a fantastic springboard for us to continue the strong progress we are making as a school and we look forward to working closely with the community in the months ahead as we march towards our next section 5 inspection. Since our inspections in May 2015, and then in May 2017, the entire school community has been working hard to secure rapid improvements at the school so that we are judged as at least a good school at our next inspection. We are pleased to say that our GCSE outcomes in the summer of 2017 will go a long way to helping us secure a good judgement at our next inspection. Please follow the link below to read a recent letter from Mr A Cunningham, Headteacher, which includes an update on our summer results. We look forward to working with you closely during the years to come as we continue our mission to ensure that The Lakes School becomes one of the best schools in England. The Lakes School was inspected on Tuesday 16th and Wednesday 17th May 2017. The governors and staff of The Lakes School are pleased to share the report from our inspection in May 2017. A link to the full inspection report can be found above along with other information on this page about our previous inspections. We were extremely pleased that the inspection team recognised the progress we are making as a school. The team said we have a lovely school and they were particularly impressed by the positivity amongst parents and students and staff and governors. They found our students to be respectful, polite and friendly and they felt that we were very much a caring, learning community. Please follow the link below to read the letter from Mr A Cunningham, Headteacher, which accompanies the inspection report. Ofsted Update – HMI Section 8 Visit 10th December 2015: We are pleased to share with you the letter written by Jean Olssen-Law, HMI, following her inspection visit just before Christmas. Jean’s letter is extremely positive about the work we are doing at The Lakes School and we are very proud to share it with you. We were particularly pleased that Jean’s findings very much match our own view of the school. Thank you for all of your support and we hope you enjoy reading the letter below. OFSTED Update December 3rd 2015: We thought that now was a good time to share with you the improvements we have made since our inspection in May 2015. Click on the link below to view a letter and a summary of our work that we shared with parents on December 3rd 2015. The Lakes School was inspected on Wednesday 20th and Thursday 21st May 2015. We would like to extend our thanks to you all for the wonderful support you provided during the period of our inspection. As you will see below, the inspection team have commented on the confidence you rightly have in the school as we continue to swiftly bring about improvements. The Lakes School is ‘going places’ and we are looking forward to sharing the journey with you, your children and the wider community. The inspection team fully agreed with our own self evaluation and judged the school as requiring improvement. We are pleased to report that the inspection team judged the Sixth Form as Good and said that the way we keep children safe is also Good. We are also very pleased to share that the inspection team could see that the changes we are making are having a positive impact on the achievement of students in Years 7 to 10 where the achievement of pupils is strong. This is an excellent endorsement for the school and for the work of our talented team of staff who have worked with great dedication to secure a number of improvements across the school in support of your child’s achievement. 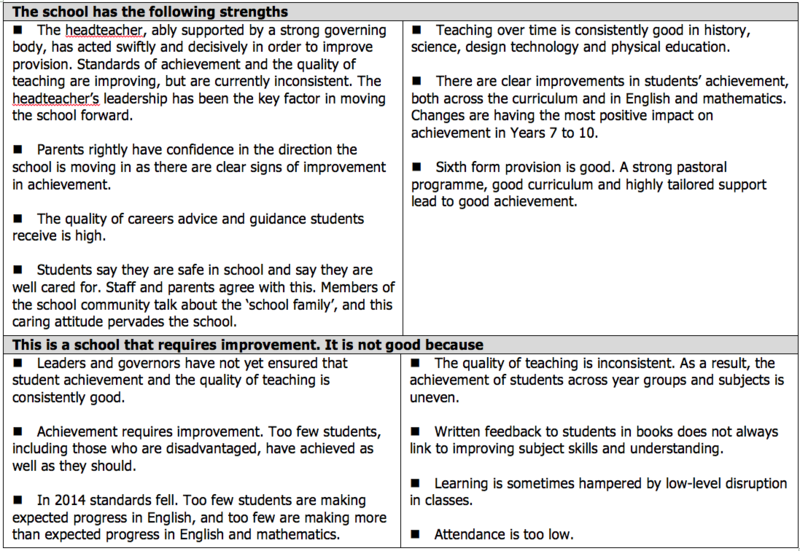 The inspection team recognised that the school has many strengths and is making significant improvements in many areas. Thank you for your overwhelming support through Ofsted’s Parent View service which showed just how much the local community is behind our school. Click here to see the Parent View summary.